Almost one in three (29%) young people across Europe are barely in control of their finances*. A new international study of financial behaviour surveying approximately 15,000 people across 15 nations reveals there is widespread concern about the financial prospects of the younger generation. The research from ING Group found that just over three quarters (76%) of people in Europe feel young people face a more uncertain future than the older generation did when they were young. Lower incomes combined with slow growth since the global financial crisis are likely to be reasons why young people in Italy, Poland and Turkey are least confident about their finances. 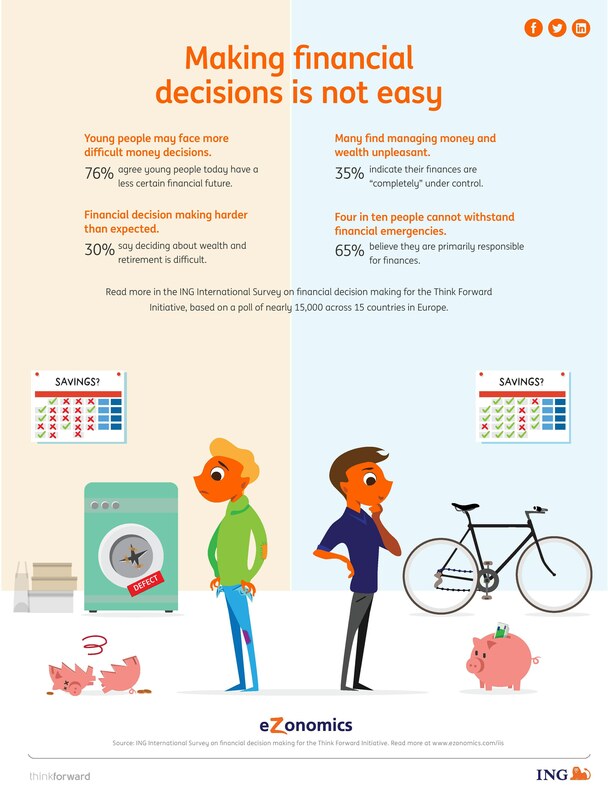 Two-thirds (66%) of the people surveyed feel young people in Europe have to make more financial decisions than the older generation faced in their younger years, implying that young people have never had it so tough financially. The downbeat assessment of the economic future is not confined to Europe, with large numbers of people in the USA (72%) and Australia (65%), the two other developed nations covered in the study, also concerned about young people’s financial prospects. In this respect, ING is working on a programme, the Think Forward Initiative, which aims to gain a deeper understanding of personal finance decision-making and use those insights to help people make decisions that are better for them, and ultimately better for society. “The condition of people’s personal finances can have a profound impact on everyday life, no matter what age you are. However, many feel that young people in Europe are facing tougher financial challenges today than their grandparents or parents ever faced,” said Ian Bright, ING Senior Economist. “In particular, government support and social security are under review in many countries and younger people often have less support than they did in the past. In addition, the financial crisis has accelerated the shift towards individuals taking more responsibility for their financial affairs. This is why research into financial education across Europe could help ensure the next generation is financially literate”.